On October 29th, 2012, Hurricane Sandy hit the northeastern seaboard of the US, wreaking havoc on many shoreline and inland areas. One of the hardest hit areas was Staten Island, New York. In response, the Silas Deane Middle School in Wethersfield gathered relief supplies for Staten Island Recovers of www.recovers.org and managed to get more than they bargained for. Having gathered over 18 pallets of aid, they needed a way to get it down to those in need. 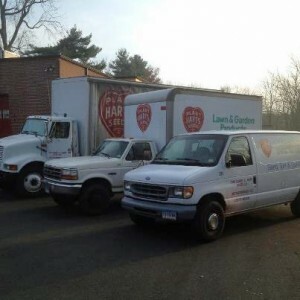 So on November 12th, 2012 at 7:30 in the morning, William Hart, Robert Hart, and Yvon Belanger set off in the Hart’s Seed truck fleet along with several SDMS teachers to pick up the supplies and head down to Staten Island. From accounts of all three men, the trip was a long one but everything got down there safe and sound to those in need. NEW for 2013, the Hart Seed Company has a Donation Department! If you would like FREE seed for your community garden, church mission, or other charitable organization please call us or contact Nicole and Melissa directly at Nicole@hartseed.com. While Hart Seed and the Hart family have been donating seed to those in need for generations, we now have a department with people dedicated to just that. Visit our Donations page for more info! The mission of Common Good Gardens is to provide fresh veggies to the shoreline soup kitchen pantries. Hart Seed has for several years donated as much as has been requested. Their garden is located in Old Saybrook behind the Grace Episcopal Church on Main Street and are always looking for extra helping hands.